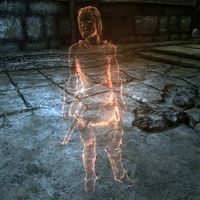 Breya is a Nord ghost in Avanchnzel. She appears to be generated when given the quest Unfathomable Depths as her RefID will change. Breya's corpse can be found near the pedestal in the final chamber of Avanchnzel, next to a dead centurion. Her corpse has separate IDs from her ghost; its RefID is 00056556 and its BaseID is 0004C754. On her corpse is a set of iron armor with matching pairs of gauntlets and boots, an iron war axe, and a selection of common loot and gold. This page was last modified on 3 July 2013, at 22:13.